This three piece occasional table set boasts an uncomplicated design that's an exceptional fit for casual or contemporary styles of decor. 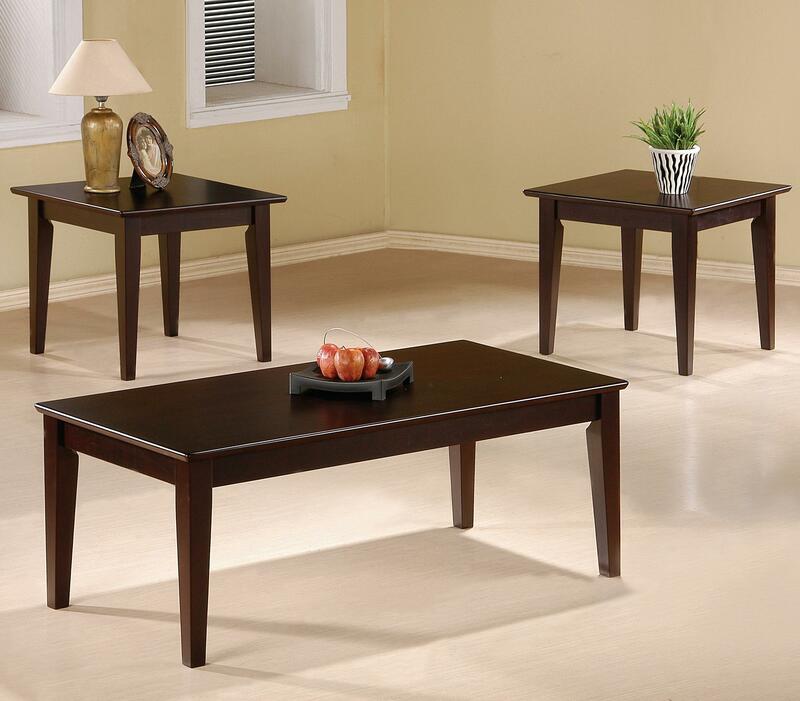 The set includes a rectangular coffee table and square end tables with smooth, flat table tops and simple tapered legs. A warm cappuccino finish wraps each end table for an indistinct style that blends seamlessly with existing living room furnishings. Dress it up with a glass or metallic lamp for a more modern feel, or top with photo frames, vases or trays for a more casual look that's ideal for everyday use. The Occasional Table Sets 3 Piece Occasional Table Set with Tapered Legs by Coaster at Al-Mart Furniture in the Oak Park, River Forest, Chicago, Elmwood Park, Forest Park, River Grove, Maywood, Melrose Park, Berwyn, Cicero, North Riverside, Brookfield, Lagrange Park, Franklin Park, Norridge, Oakbrook, Elmhurst, Bensenville, Lyons, Stickney, Harwood Heights, IL area. Product availability may vary. Contact us for the most current availability on this product. The Occasional Table Sets collection is a great option if you are looking for furniture in the Oak Park, River Forest, Chicago, Elmwood Park, Forest Park, River Grove, Maywood, Melrose Park, Berwyn, Cicero, North Riverside, Brookfield, Lagrange Park, Franklin Park, Norridge, Oakbrook, Elmhurst, Bensenville, Lyons, Stickney, Harwood Heights, IL area. Browse other items in the Occasional Table Sets collection from Al-Mart Furniture in the Oak Park, River Forest, Chicago, Elmwood Park, Forest Park, River Grove, Maywood, Melrose Park, Berwyn, Cicero, North Riverside, Brookfield, Lagrange Park, Franklin Park, Norridge, Oakbrook, Elmhurst, Bensenville, Lyons, Stickney, Harwood Heights, IL area.